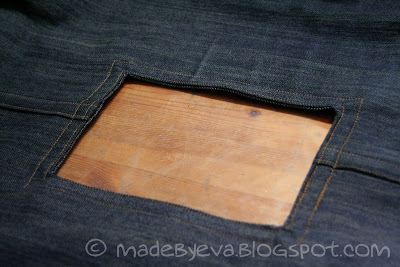 When it came time to cut the openings for the handles in my denim firewood tote, I encountered a major obstacle. 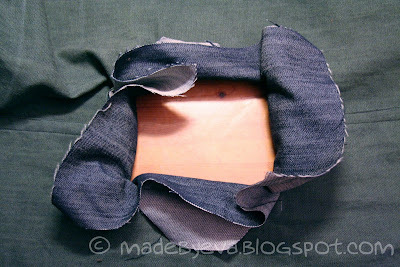 My original plan was to simply fold back the fabric and topstitch it in place, but that turned out to be a very weak and flimsy technique. 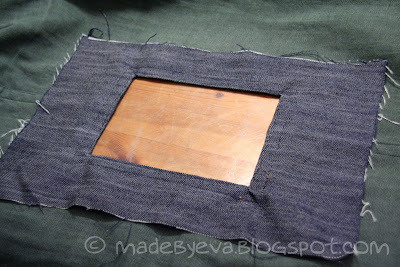 Not only did it look bad, but the corners would definitely have frayed badly already after its first use. No, it was time to find a more sturdy solution! I vaguely remembered having seen a tutorial on something suitable ages ago, but only had a very vague ide of how it would look when finished, and no idea at all of how to get there. After an hour searching for it on Google with no luck, I spent another hour with pen and paper to figure it out for myself. There's just no stopping me when I get these ideas stuck in my head. ;) And I did figure it out! :D So although there is a tutorial out there (and it's probably written better than mine), I thought I'd make my own, just in case anyone needs it. Maybe mine will show up on Google. ;) It must be said that I am an amateur sewer and really have no idea of what I'm doing here. You have been warned. 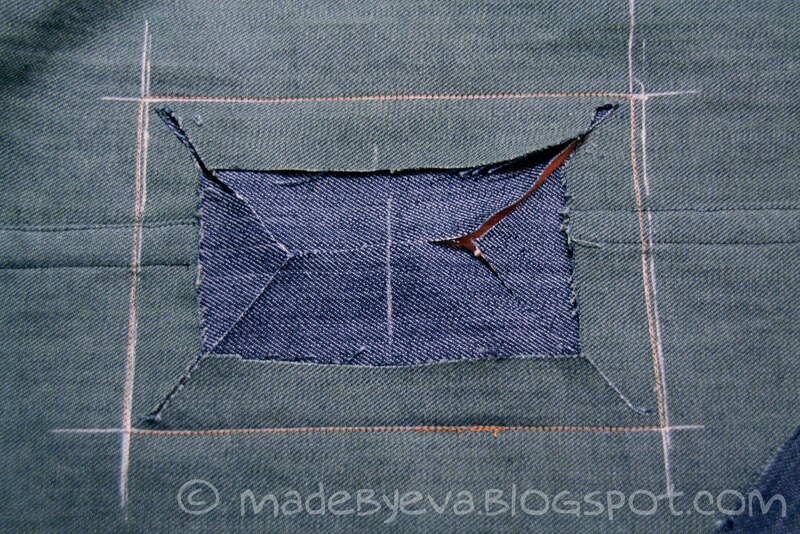 Sew a rectangle along your lines (refer to picture above). 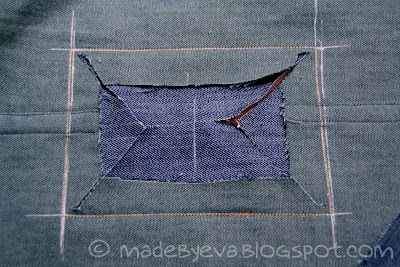 Then, cut into both fabrics in a 45 degree angle towards the corners (refer to picture). My opening is not square, so I did a straight cut across the center, to connect the angled cuts. 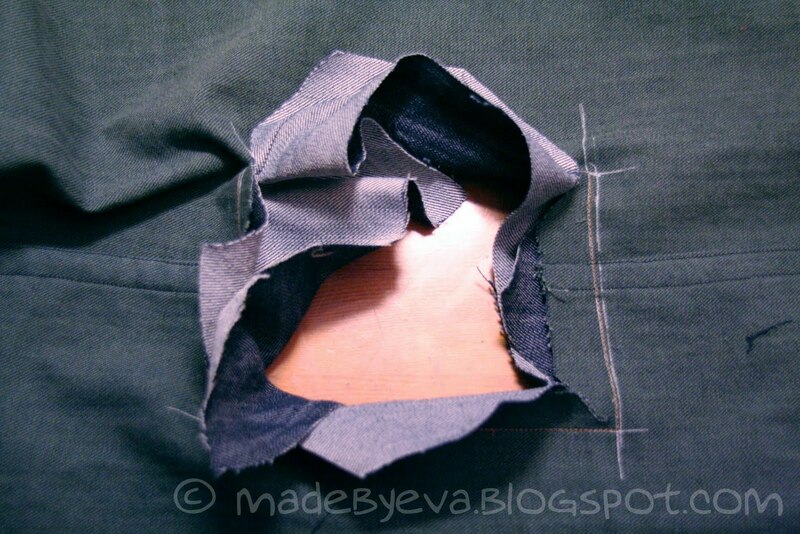 As mentioned before, you can see that I had already cut a hole in my main fabric as a part of my discarded Plan A, but that's not nescessary. Lines are all you need. Go as far as you dare to the corner, but be careful! 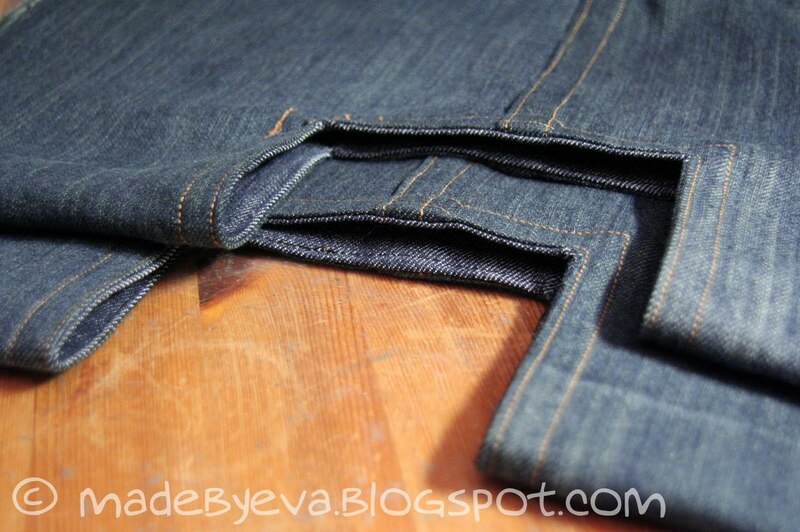 If you cut too close, the fabric will unravel - or even worse, you'll cut the actual seam. 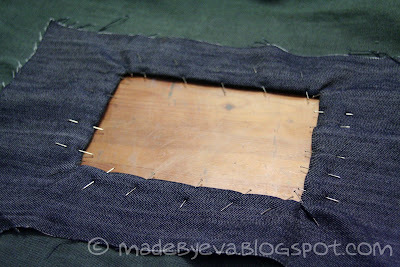 ...and turning, until all the lining fabric has been brought to the reverse side. You are now looking at the right side of the lining fabric and the wrong side of the main fabric! And now you can see the size of my lining piece. You may have to do some small additional snips towards the corners if they are very bulky - just be careful to not cut too close, or to cut the actual seam! 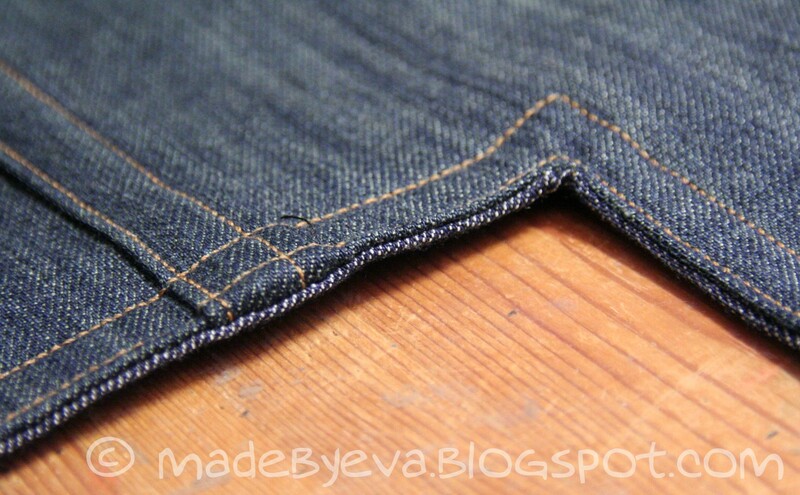 You will now have two layers of fabric with angled cuts hidden under the visible part of the lining. Pin in place, pulling the lining well back. 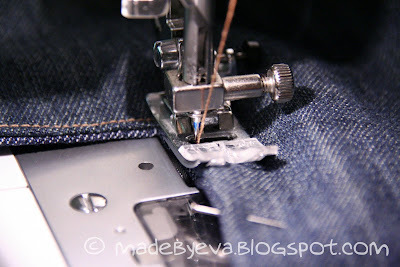 I pin from the wrong side, but will sew on the right side, so I take care to ensure that all pins are accessible through the opening. 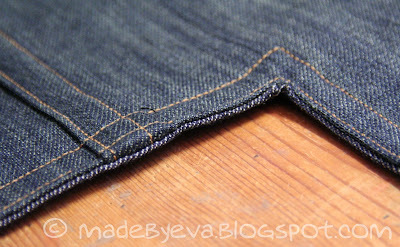 Topstitch as close to the edge as possible. 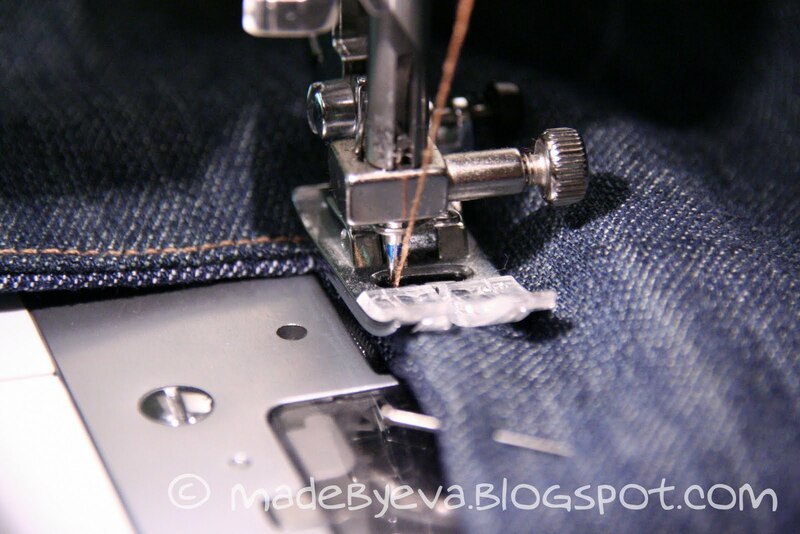 If you look carefully, you'll see that I've offset my needle all the way to the left, enabling almost the entire presser foot to rest on the fabric and both feed dogs to grab onto the fabric. You might find it easier that way, instead of having half the presser foot floating in the air... I did a second topstitch seam outside the first, just to make it match visually to the rest of the tote. Also, if you have have to sew across french seams, like I had to here, I strongly recommend hand feeding the needle over the thickest parts. Ta-daa! Flip over and admire your finished result! I'm so proud and satisfied with this, you have no idea. :P It looks twice as good and must be at least four times stronger than my first plan! A closer look at the details. 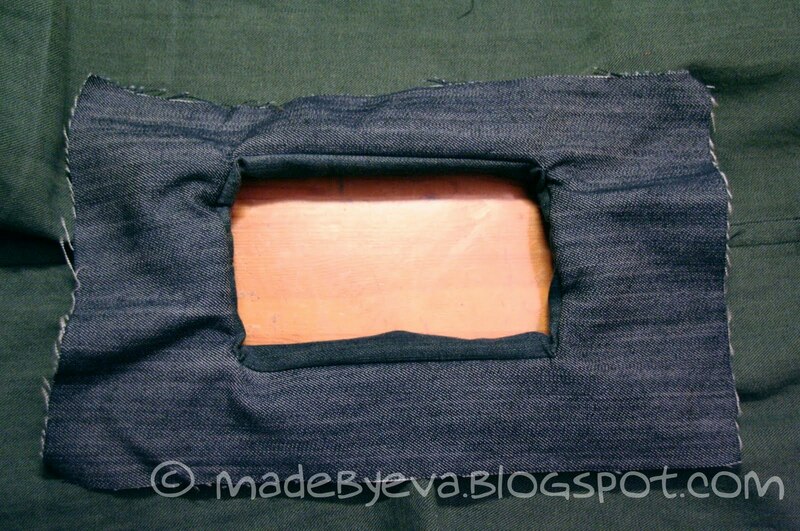 You can just spot the lining fabric in the opening. And here are my two openings, ready for the handle to be inserted.